A special thank you to NetGalley and Disney Book Group/Disney-Hyperion for an ARC in exchange for an honest review. This was a solid 4/5 stars for me. The climax was a little contrived, but overall, it was wonderfully written with carefully thought out characters. Adam Blake is a senior with an interesting elective; he is an aide to the school psychologist. Adam has ADHD and perhaps sitting around isn't the best choice for him, but with his incredibly positive outlook he rises to the challenge of working for Dr. Whitlock. His first task is to track down a troubled freshman that has been avoiding their sessions with said doctor, and that boy is Julian who five years earlier was his foster brother. Adam is thrilled at their reunion. Julian is still kind, shy, quiet, and loves his Elian Mariner books, but there is something off about him. He is secretive and hides out during the day, often misses school, and things aren't what they appear with his home life. Adam is determined to help Julian, resuming his "big brother" role, but at what cost? This was a solid 4/5 stars for me. The climax was a little contrived, but overall, it was wonderfully written with carefully thought out characters. 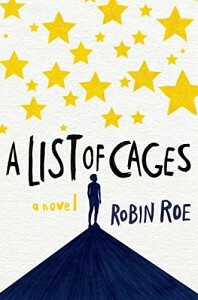 This is Roe's debut novel and her future is as bright as ten thousand stars.